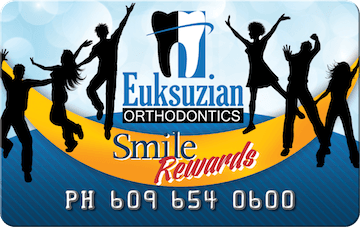 Welcome to the website of Euksuzian Orthodontics! At our office, we believe everyone deserves to love their smile, and our mission is to help each one of our patients achieve a healthy, beautiful smile that lasts a lifetime. Dr. Sarkis Euksuzian and our highly trained orthodontic team work hard to treat each patient individually, designing personalized treatment plans to suit any lifestyle, and we strive to make every visit to our office a pleasant experience. We’re proud to use only the latest in state-of-the-art orthodontic technology, and we offer a variety of treatments to our patients including braces and Invisalign. We’ve helped countless patients throughout the areas of Medford, Moorestown, Mt. Laurel, and Marlton achieve a gorgeous new smile, and we would be thrilled to do the same for you! Clear Braces: These work the same as metal braces, but the brackets are made from a clear ceramic composite material. This means they blend in with teeth, providing a more aesthetically pleasing treatment that’s just as effective as braces. Metal Braces: Made from high-grade stainless steel, these are what most people picture when they think of orthodontic treatment. They’re durable, reliable, and cost-effective. Gold Braces: Want to add some style to your smile? We offer 24 karat gold-plated braces that add a fun, unique look during treatment! Invisalign: Instead of brackets and wires, Invisalign uses clear, removable aligners to straighten teeth. They’re virtually invisible when worn and can be popped in and out to eat, drink, brush, and floss. Your rewards points will only grow as you move forward with your orthodontic treatment, and more points means more prizes! As you collect points, you can log in to our Patient Rewards Hub to exchange your points for gift cards from popular retailers like Starbucks, iTunes, Amazon, Target, and more. We’re proud to provide excellent orthodontic treatment to patients of all ages throughout the Moorestown, Medford, and the surrounding areas, and if you’re considering orthodontic treatment for yourself or a loved one, we’d love to hear from you. You can call us at (609) 654-0600 for our Medford office or (856) 234-2992 for our Moorestown office, reach out to us at our contact page, or request a free consultation at either of our offices by using the form below. We can’t wait to hear from you, and we look forward to helping you achieve a healthy, beautiful new smile! We strive to provide peerless treatments and patient care – but don’t just take our word for it. Hear what past patients have to say about Euksuzian Orthodontics!